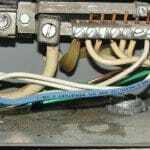 Two neutral wires under one screw or in one slot on the neutral bar of an electrical panel is a safety concern. Water and electricity do not mix well, so when a panel is rusted or corroded; maintenance, review or replacement may be wise. 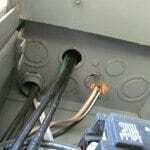 Knock-outs missing in electrical panels are hazardous but easy to correct. 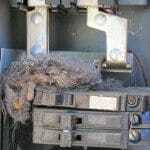 It is amazing how rodents can get into an electrical panel. 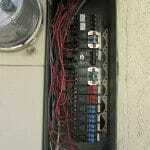 Keeping rodents, bees and and other vermin out of an electrical panel is wise. All missing panel covers need to be replaced. 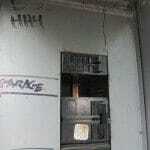 The covers protect the electrical components of the panel and provides safety. Can you guess how the panel cover called a "Dead Front" cover got its name? Should you need to get to the electrical panel to reset a breaker, or shut off the power if there are smoking or sparking electrical wires, then access is very important.